Possibly the first published map of the Prospect Park Parade Ground. Plan for the Parade Ground Proposed to be Laid out for Kings County L. I. 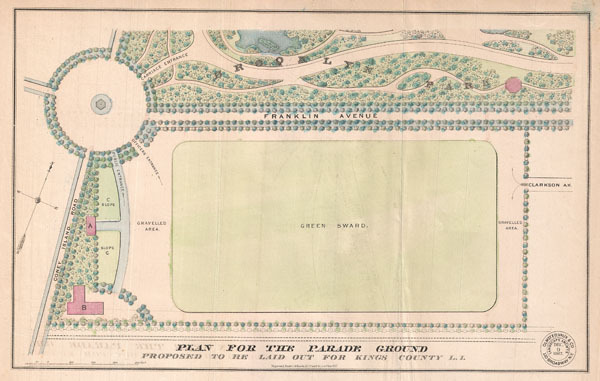 An extremely scarce example of Vaux and Olmstead's map of the King County Parade Ground (today known as the Prospect Park Parade Ground, or the Prospect Park Base Ball Grounds). The Parade Ground is bounded by Parade Place, Franklin Avenue (now Parkside Avenue), Caton Avenue, and Coney Island Avenue. The Ground was designed by Olmsted and Vaux in conjunction with the adjacent Prospect Park. The Parade Ground saw its first parade in 1867 when the 11th Brigade's Howitzer Battery strutted their stuff. Although intended from the start as a military facility, sports moved in early, and by 1871 the Parade Ground was being described by Henry Chadwick as the 'finest free ball ground in the United States.' This map was published in the 1868 edition of William Bishop's Manual of the Common Council of the City of Brooklyn.